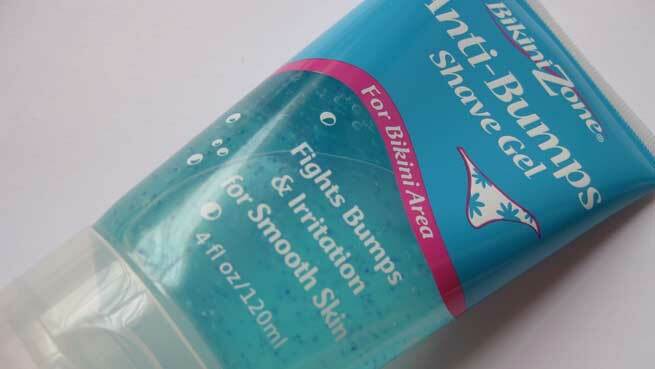 If shaving often leaves you with cuts, bumps, and razor bumps, the BikiniZone Anti-Bumps Shave Gel is what you need in your life right now. The extra-gentle formula is exclusively made with soothing botanicals, moisturizing microbeads, emollients, and vitamins (A and E) for the delicate bikini area and helps prevent several issues (bumps, irritation, redness, ingrown hair, etc.) from developing after shaving. Get a perfectly smooth skin after every shave and feel confident in it as the shaving gel stands accurately to its claims. Price: $4. for 4 fl. oz. 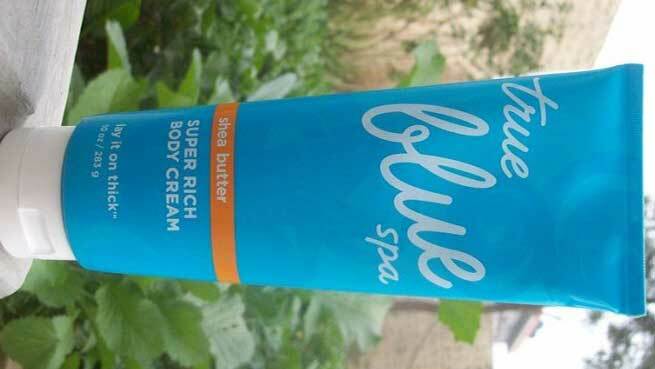 Every woman wishes to have a hairless, silky smooth skin and this Bath & Body Works True Blue Spa Shave The Day offers exactly the same. The silky smooth cream with shea butter helps the razor glides across your skin easily and removes your body hair impeccably without making you feel the pain. The divinely soothing cream also comes infused with vitamin E, which adds to the effects of shea butter and makes your skin unbelievably smooth and touchable. Price: $14.99 for 7.5 fl. oz. 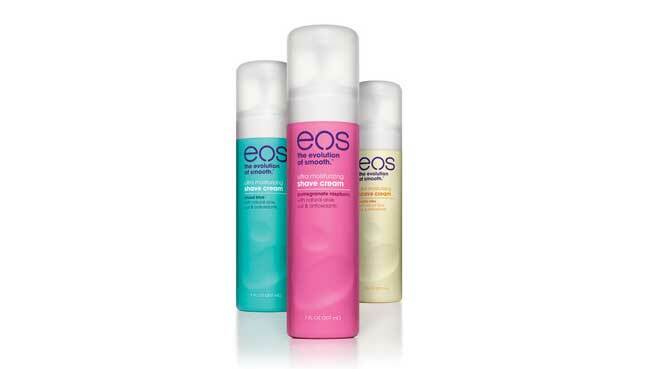 The EOS Ultra Moisturizing Shave Cream claims to redefine smoothness and make you smile with its unique herbal formulation and sweet smell. Enriched with tons of natural moisturizing ingredients like aloe vera, oat, and shea butter, it soothes the skin as you shave and boosts its moisture level. It also features antioxidant vitamins (C and E) to make your skin look healthy and radiant. The non-foaming cream allows you to shave both wet and dry, provides a closer shave, prevents small razor bumps, keeps the skin smooth long after shaving. It is available in a variety of scents including vanilla bliss, tropical fruit, pomegranate raspberry, lavender jasmine, etc. Price: $7.59 for 7 fl. oz. 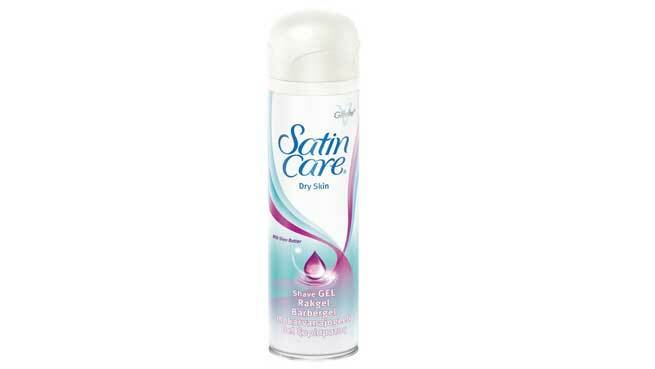 This Satin Care Dry Skin Shave Gel from Gillette is a hot favorite among women of all ages due to its miraculous hair removal effects. It offers amazing glide to protect your skin against nicks and cuts. The specially made dry skin formula contains glycerin and shea butter to help the skin attract and lock in its natural moisture, thereby preventing moisture loss during the shave. Get it for a moisturized, soft, and satiny smooth skin. Price: $4.7 for 7 fl. oz. 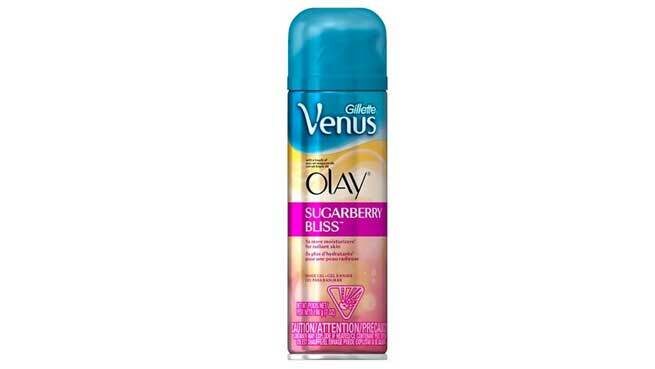 If you have a normal skin and you are looking for one of the best shaving gels invented ever, the brilliance of this Gilette Venus Satin Care Shave Gel With A Touch Of Olay Sugarberry Bliss will certainly steal your heart. The advanced formula comes with 5X more moisturizers than regular shave gels, which prevents the loss of moisture from the skin during shaving. In addition, the ultra-creamy texture of the gel keeps redness, razor burns, and nicks away. It also offers remarkable coverage to prevent missed spots and gives you a flawless, radiant skin every time. Price: $9.30 for 6 fl. oz. 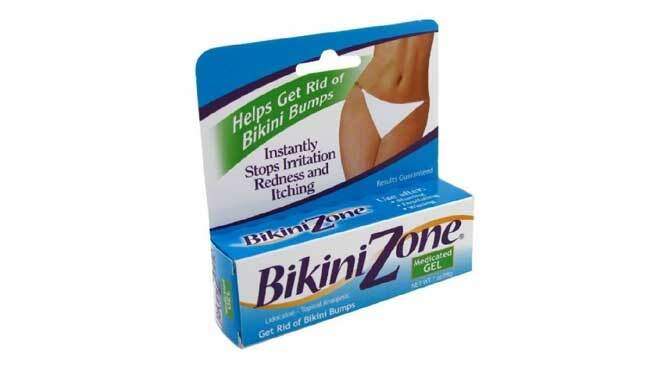 When it comes to getting rid of bikini bumps, nothing can work faster than this Medicated After Shave Gel by BikiniZone. The dermatologically tested product can stop redness, irritation, and itching almost instantly after shaving, waxing, and depilating your sensitive bikini area. It is also formulated with a topical analgesic called ‘lidocaine’ to give you fast relief from pain. Price: $10.50 for 1 oz. The Kiss My Shave Moisture Shave is a perfect solution for razor burns and other similar post-shaving issues in people with dry skin. It has an exceptional ‘4-in-1 formula’ containing botanical blends, such as aloe vera, lemongrass, soapwort, goldenseal, lady’s mantle, etc. along with olive oil and coconut oil for softening, smoothening, soothing, and moisturizing the skin beautifully. The fragrance-free cream with a protective texture also helps in curing post-shaving problems in the most sensitive skin. Price: $9.99 for 11 fl. oz. 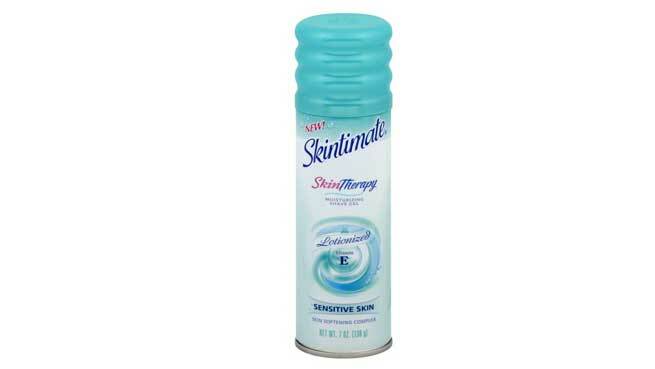 The Skintimate Skin Therapy Moisturizing Shaving Gel is much loved for its nourishing post-shaving effects. Enriched with emollients, conditioners, and lubricants including vitamin E, olive butter, and lanolin, this moisturizing and ‘lotionized’ gel formula helps replenish the natural moisture of the skin while taking care of the sensitive skin. It also produces a rich, creamy lather to let your razor glide smoothly and ensure the closest possible shave, leaving a silky smooth skin behind. Price: $7.04 for 8 fl. oz. 9. Lippmann Collection Did I Shave My Legs For This? Although the cost of the Lippmann Collection Did I Shave My Legs For This shaving cream is comparatively high, the herbal hair removing product does its work wonderfully without making you feel the use of the razor. The exclusively designed formula uses an Ayurvedic complex blending green coconut water, Withania root, and exotic acai oil for smoothening, moisturizing and toning your skin while removing hair. It also comprises natural botanical essential oils, such as lavender, mint, lemon, cypress, etc. for relaxing your senses and soothing your skin. Price: $24 for 7 fl. oz. If you feel an irritating dryness each time after shaving, this Pure Silk Plumeria Breeze Moisturizing Shave Cream is your solution. It has an exceptionally moisturizing formula featuring aloe vera, which softens your skin before shaving, nourishes it as you go ahead, and keeps it hydrated for long. The rich and luxurious shaving cream also protects against nicks and cuts while offering a close shave, leaving your skin feeling silky smooth. Price: $3.5 for 8 fl. oz.